Author Ed KohlerPosted on September 19, 2013 September 4, 2018 Categories Minneapolis, Politics, Vikings2 Comments on What’s Happening to the Minneapolis City Council Members Who Voted For/Against the Vikings Stadium #wilfare Bill? Why do the vast majority of downtown buildings NOT have large signs advertising who resides within those businesses while the Hubert H Humphrey (named in his memory) Metrodome have on its roof for a mall in Minneapolis suburb? If Minneapolis is going to allow advertising on downtown buildings, shouldn’t they put businesses who actually reside in downtown Minneapolis ahead of ads for businesses outside the city? A few years ago, I did the Segway tour out of St Anthony Main and listened to question after question from people who wondered which businesses occupied the towers in downtown Minneapolis. People honestly don’t know which businesses are contributing to make Minneapolis’ core such a strong and vibrant downtown due to the lack of logos on buildings. Those businesses deserve the recognition that a certain dough boy doesn’t. Which is why it’s extraordinarily weird that one of the only brands you can find on a downtown building is an ad sold by a private company to another private company for an ad that appears on a publicly financed and publicly owned building. As I see it, both policies are too extreme. We should allow private businesses to promote themselves on privately financed buildings. And, we should not allow private businesses to sell advertising to private companies on publicly subsidized buildings (unless the revenue goes toward paying back the subsidies). Is the Minneapolis City Charter Too Complicated? Although Segal agrees that the current charter is overly long and complicated, she said that complexity hasn’t caused any problems. On the contrary, she said, thanks to 93 years of legal opinions and precedents, there is no confusion about what the document means. The city, based on Segal’s legal advice, decided that a referendum was not necessary when the city voted on a 7-6 vote to commit hundreds of millions of taxpayer dollars to build a pro sports facility, to purchase land, for site preparation, for road changes, for parking development, surely for sewer and water as well, and for a skyway (other infrastructure). To me, it doesn’t seem like there’s any confusion about what that section of the charter means. None at all. Which makes me wonder whether Segal was confused by that section, or if she was simply willing to violate the clear intention of the charter’s language in order to commit hundreds of millions of taxpayer dollars to subsidize the National Football League. Author Ed KohlerPosted on July 29, 2013 Categories Minneapolis, Politics, Vikings2 Comments on Is the Minneapolis City Charter Too Complicated? I’m impressed that the Vikings managed to create enough fear in face painters to get them to take time off from their jobs to lobby, for free, on behalf of a for profit corporation. And, it’s doubly impressive that the face painters lobbied for a stadium plan that essentially eliminates tailgating. Parking lots will be replaced with a stadium that achieves the same task as the Metrodome with twice the space, a park, and new developments. The Vikings got their subsidies thanks to purple painted Vikings fans wandering the halls of the state capitol, but no one thought preserving parking lots for purple RVs, vans, trucks, and motorcycles was a priority. Obviously, the face painters could get organized and pool their money to purchase a downtown parking lot in order to preserve it for tailgating. They could, but they won’t because that would involve them spending their own money to pay market rates for their entertainment. Based on how hard they lobbied for public subsidies for their private entertainment, it’s clear that they’d rather see tailgating die than open their own wallets to cover the true cost of their 10 day per year hobby. Sadly, Governor Dayton decided to raid the General Fund to take money from schools and bridges to make up for e-pulltabs shortfalls. He did this by redirecting the first year of the new cigarette taxes to cover the first year of shortfalls from e-pulltabs. His justification was that the project – like some of our state’s schools and bridges – could fail without the funding. Sadly, he didn’t seem to realize that less than a year into a 30-year commitment is a great time for a project to fail. When you make a mistake it’s great to fail fast. The new park and proposed development near the new stadium look promising. One of the cool things about visiting Central Park in NYC is looking at the condos surrounding the park and imagining living there. Imagine hanging out in the proposed park on one of the 42 weekends the stadium will be sitting empty, two corporate towers, the backside of Thrivent, and the architecturally uninspired HCMC to view. I’m not sure it has the same effect. 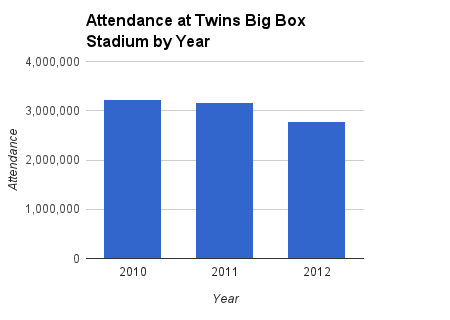 That’s why the Minneapolis 2025 plan (PDF) called for moving the Vikings stadium over by the Twins stadium. The land where the Metrodome sits is more valuable today for new residential and business developments than it is as a taxpayer subsidized and property-tax exempt NFL subsidy monstrosity. We could have done this far better if the city and state hadn’t negotiated from an irrational state of fear. It’s funny that the NFL doesn’t endorse gambling unless they directly profit from the exploitation of people living in some of the poorest communities in Minnesota. In that case, they’ll take the money. It’s also funny that the NFL doesn’t run tobacco ads, but they’re cool with Minnesota taxing the crap out of the state’s smokers in order to provide corporate Wilfare to the Vikings. Any word on whether the stadium will support running and rollerblading? This is the “People’s Stadium”, right? 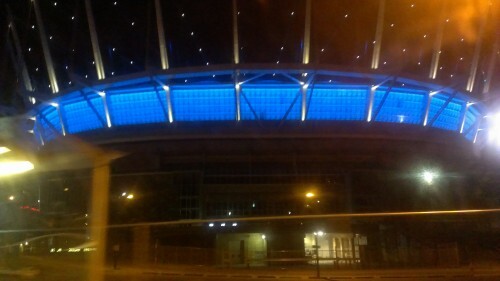 That’s Vancouver’s BC Place stadium. That’s the stadium that used for the Opening Ceremonies of the Winter Olympics, for the BC Lions CFL football team, for the Vancouver Whitecaps MLS team, and for the largest concert tours in the world, including Taylor Swift & Jay Z + Justin Timberlake. This is a first class venue both inside and out, both day and night. And, the truly innovative part of it is that they managed to build a world class venue for half the price Minnesota is spending to tear down the Metrodome to build a slightly larger stadium on the same footprint. Vancouver decided to be take a far cheaper and greener approach when they came to the conclusion that their Metrodome-equivalent stadium was due for an upgrade before the Olympics. They managed to add better seats, better concessions a retractable roof, open the stadium up with more natural light, keep the football team playing in the stadium by doing the upgrades during off-seasons, and did it on half the budget being used to tear down and rebuild a stadium in Minneapolis. If Minnesota had taken a similar approach there wouldn’t have been a need to come up with a creative way to finance the stadium through questionable gambling exploitation tactics. Functional world-class cities aren’t judged by the amount of taxpayer money they can spend to subsidize private corporations. If they can solve a problem with less money, they do. That’s good government. New York spent nearly nothing on the NFL stadium that’s shared by two teams in their market. Los Angeles profits from not having an NFL team draining their city’s tax base. Then there’s Cincinnati, where NFL subsidies have become a higher budget priority than local hospitals. It’s no wonder that they’ve lost 5% of the county’s population over the life of the current stadium. People with marketable skills have options. “I believe it is sound, reliable, and sufficient to finance the state’s share of this project. Anyone who says otherwise is speaking without my authorization and is seriously misrepresenting my position. As Senator Sean Nienow has been saying on Twitter, Dayton owns this debacle. The above statement makes it pretty darn clear. Furthermore, everyone trying to dismantle this proposal, without offering a better one, is clearly trying to defeat the bill. First, it’s perfectly legitimate to try to defeat a bill that provides corporate Wilfare to an organization that doesn’t need it but simply wants it. It’s legitimate to argue that it’s not the state’s job to subsidize the NFL. It’s perfectly legitimate to argue that the Vikings, together with Vikings fans, could work together to come up with a private financing scheme if they really felt that a new stadium was worth the cost. Some called for the Vikings to chip in a far larger share. Some called for paying for the stadium through taxes on sports related merchandise, tickets, and naming rights. Some called for subsidizing the NFL by exploiting the state’s gamblers through slot machines at horse tracks. But, all of those ideas were rejected by the legislators carrying the bills through the house and senate, who were clearly working with Governor Dayton to craft the bill. The topic on the floor at time of Rep Gruenhagen’s speech was to amend the stadium bill to fund the state’s share through user fees. As in, the Minnesotans who claim to want a new stadium would have an opportunity to actually pay for it through taxes on merchandise, seat fees, concessions, parking, among other taxes. This, of course, did not pass. Obviously, Zygi didn’t want Vikings fans paying for the Vikings stadium when the state was willing to exploit gamblers instead. That leaves more money in fans’ wallets for Zygi to extract through higher seat prices, personal seat licenses, parking, concessions, and merchandise. Fans will pay whatever Zygi can extract from them, yet didn’t have enough pride to say “hey, shouldn’t we be offering to help the state with this so the state doesn’t need to exploit gamblers through questionable gambling schemes?” But, fans together with Governor Dayton and the state legislature, lead by Senator Rosen and Rep Lanning, decided to protect Zygi’s access to Vikings fans’ wallets by exploiting gamblers instead. And, if I understand this bill correctly, the state will be selling PSLs to Vikings season ticket holders on Zygi Wilf’s behalf. Why? Because, in addition to paying for half of a billion dollar stadium, paying to maintain the stadium, and letting Zygi pay no property taxes on valuable downtown Minneapolis land, we’re also going to sell hit PSLs for him so they can be sold tax-free. In each of those cases, the taxpayer’s lose for the benefit for the richest sports league in the United States. They’re rich for a reason: corporate Wilfare. 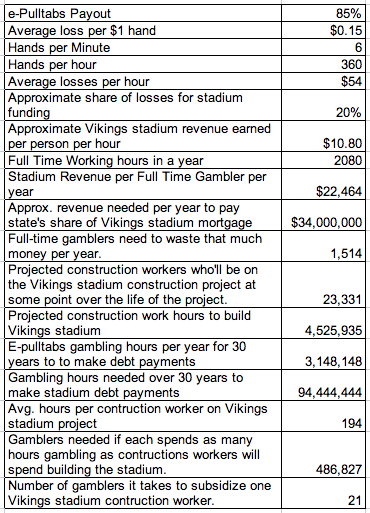 Tim Nelson at MPR’s Stadium Watch blog has published a breakdown of the projected construction worker hours for the Vikings stadium construction project. It turns out that it takes a lot of hours to build a billion dollar stadium with bathrooms in every suite and a VIP parking ramp so corporate types don’t have to go elbow to elbow with the face painters. The Minnesota Sports Facilities Commissions numbers claim that the stadium will take 4,525,935 worker hours, during which 23,331 workers will be on site for an average of 194 hours each. It will take around three years to build the stadium, so that comes out to the equivalent of 725 full time jobs for three years at a cost of around a million dollars per job between state and city subsidies once interest on the borrowed money is factored in. Here’s how this breaks down: E-pulltabs have an 85% payout, which means that people lose an average of 15 cents on every $1 bet. Around 20% of that 15 cents in losses (three cents for every dollar bet on average) goes toward the state’s share of the Vikings stadium debt. If the average e-pulltabs gambling rate is one hand every 10 seconds, they’ll lose an average of $54/hour. Approximately $10.80/hour would end up going toward the stadium. How many hours does it take to lose enough money at e-pulltabs to cover the state’s share of the Vikings stadium mortgage? A sinking Vikings ship load. At $10.80/hour in e-pulltabs losses, Mark Dayton, Julie Rosen, and Morrie Lanning, and John Kriesel decided that it would be in the best interest of the State of Minnesota to dedicate the equivalent of 1,514 Minnesotans to tapping e-pulltabs screens 40 hours per week for the next 30 years. That’s 3,148,148 hours of Minnesotans’ time devoted to tapping e-pulltabs screens every year for the next 30 years to subsidize the state’s share of NFL subsidies. Let’s talk about jobs. Labor likes to inflate jobs numbers by discussing how many people will spend time on the job site rather than talk in terms of full-time equivalent positions. Let’s use their style of math for a comparison. When Governor Dayton talks about the jobs the Vikings stadium creates, he shouldn’t focus solely on construction workers. He should also consider the 21 gamblers he created to subsidize each of those construction jobs. For example, to cover the state’s share of employing 84 full-time equivalent electricians for three years, approximately 10.8 million hours hours will be wasted by Minnesotans tapping e-pulltabs screens, causing them to lose $586 million. As Governor Dayton has stated to defend Vikings stadium Wilfare financing, there’s plenty of blame to go around. Still, it was Governor Dayton who pulled on a Vikings jersey and held rallies in favor of this disaster, and put his signature on the bill. According to SportCity.com, Jared Allen is scheduled to make $14,280,612 as a Minnesota Viking in the 2013-14 season. That’s a good chunk of change. Now, imagine if Allen developed a nasty e-pulltabs gambling habit. I know that it’s hard to imagine Jared Allen having nothing better to do with his time than slowly lose money by tapping obsessively on an iPad screen, but give it a try. How long would Allen have to play e-pulltabs to lose $14,280,612? While Weaver appears to have been way off in his projections of the popularity of games he distributes to bars, I think his assumptions about the speed of play are pretty fair. It doesn’t take long to tap an iPad twice, so it’s pretty easy to play the games at that pace. The payout on e-pulltabs games is set at 85%, so for every $100 you play, you’ll – on average – have $85 left. Let’s assume that Jared Allen has fast hands, so can play e-pulltabs machines at the faster end of John Weaver’s projections (one hand every 10 seconds). Let’s also assume that when Allen plays e-pulltabs he never gets distracted by conversations, signing autographs, or going to the bathroom. And, let’s assume that Allen plays $1 hands. Based on those assumptions, Allen would lose an average of 90 cents per minute (six hands with an average loss of 15 cents), or $54 per hour. At that rate, it would take Jared Allen 264,455 hours and 46 minutes to blow a year’s salary. With an 8 hour per day e-pulltabs habit (360 hands per hour) it would take Allen 127 years to lose one year’s salary. Or, Allen could drag 126 of his closest friends to a bar where they could each spend 40 hours a week, every week, for an entire year, collectively blowing through $14,280,612. Now, here’s the downright pathetic part. Spending 127 years playing e-pulltabs at a rate of 6 hands per hour for 8 hours per day every working day of the year sounds like an incredible waste of time. But, were Allen to do that, he wouldn’t come close to raising enough money to cover even one year of the mortgage on the Vikings stadium debt the state offered to pay to subsidize Zygi Wilf’s private business. Something like 20% of Allen’s $14,280,612 in losses would end up going to help pay the mortgage, so around $2.8 million with the rest going to the e-pulltabs vendor, the bar he spent 127 years of his life in, and a probably-questionable charity. So, while Jaren Allen isn’t going to spend 127 years of his life tapping iPads to help pay for a fraction of one year of the state’s share of the mortgage costs of the Vikings stadium corporate Wilfare bill, the reality is that an enormous number of Minnesotans will need to do that in aggregate to make the projections work (which probably explains why they don’t).